My husband and I had another opportunity to go to Truth or Consequences, NM, for a weekend before it just gets too hot to visit. We love to get out and go four-wheeling and explore the countryside. As it’s still spring I was hopeful for some good birding opportunities. Last Saturday we went to Caballo Lake for the day. It was forcasted for sunshine but windy. Wow…it got very windy. My husband loves to prospect for gold. So while he went to a favorite canyon, I headed out to bird along the roads and around the lake. I was able to bird for about 2 hours in the morning but even then it was blowing pretty good. I mostly saw Black-Throated Sparrows and a variety of flycatchers. I was amazed even in that wind that they were able to pluck bugs out of the air with ease. As the morning progressed it got extremely windy. So I headed back to the truck and took a nice long nap. Upon waking I realized the wind had died down. So I jumped back on the four-wheeler and headed out. I remember last time I was there I saw my first Pyrrhuloxia in a specific canyon. So I decided to head back in that canyon for a second try as my first photos were barely discernible. And I was quickly rewarded with a sighting. And I got some good pics too! Heading back to the truck I saw a few hummingbirds hanging out in a blooming tree. I managed to get a pic of a couple of them. The views of the mountains and lake were beautiful. I love photographing vistas. The next morning I saw the hotel owner filling the bird feeders in the front garden area. The birds must be used to the routine because as soon as they saw him they all came flying in. I got a few good pics before we headed out for another day of fun. 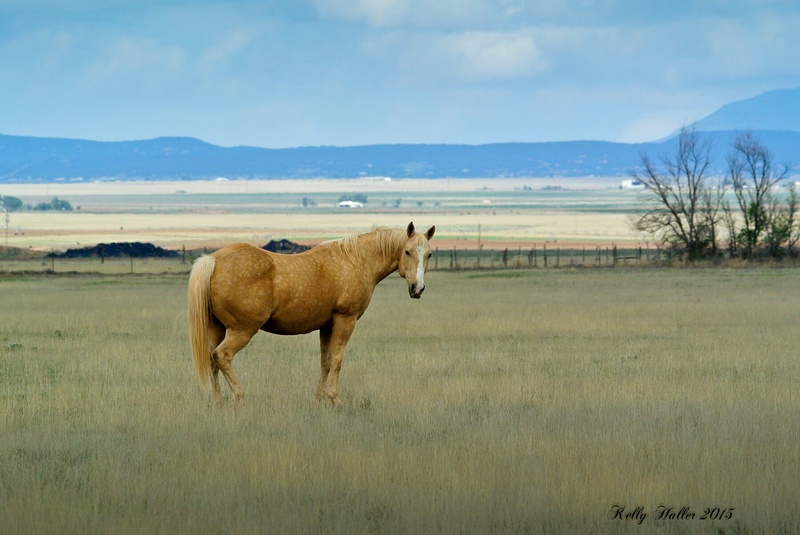 On Sunday we headed to the hills around Hillsboro, New Mexico. As I’ve said before, they are like night and day from the Caballo Mountains and they aren’t that far away from each other. I love the more lush landscape and fewer cactus. Plus there’s more historical items left behind to investigate. The morning weather was beautiful…calm, slightly overcast, cool. The lighting was perfect for photos. As soon as we parked our four-wheelers to hike up a particular canyon, I saw a Scaled Quail calling from atop a bush. I even video taped him singing. 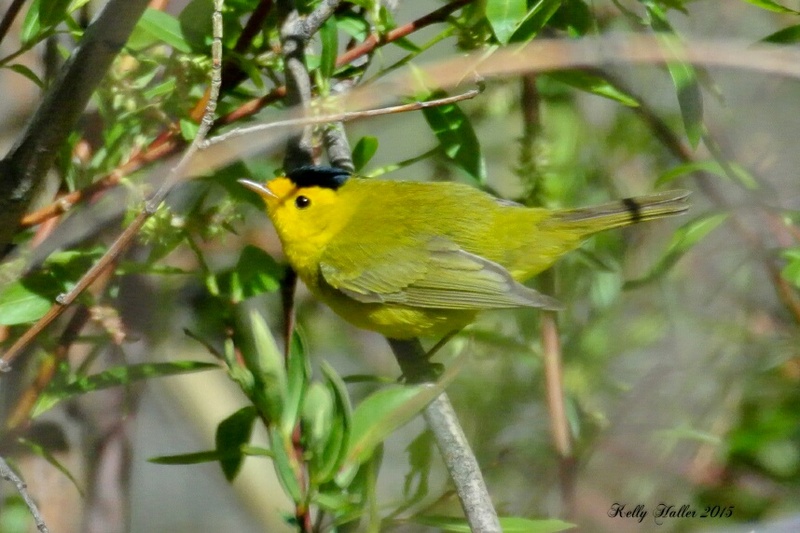 I was rewarded by a sighting of a Macgillivray’s Warbler. I then saw the female and found their nest. Took a quick pic of the nest and then moved on so as not to disturb them. I managed to get one photo of the male. They stayed deep in the foliage. I had a great day birding. Because it was cooler the birds were active all day. While eating my lunch I sat beneath a shade tree and was entertained by a pair of Say’s Phoebes who were busy all day feeding their babies. They picked a very unusual location for their nest. There is an old well in the area and the birds have figured out how to dive into it for a drink. The Phoebes have built their nest down in that well. They were busy catching bugs, landing on the barbed wire surrounding the well, and then diving in to feed their babies. Old Well that birds fly down to drink. The Phoebes have a nest down there and loved perching on the barbed wire before diving down the well. Because the winds were calm I was able to get several photos of butterflies. Mexican Yellow is the butterfly with the white open wings. The other butterfly with the orange inside is a Sleepy Orange. Gray Hairstreak – it must have just emerged because it was sitting and rubbing its wings and was unwilling to fly. The views in Hillsboro were very nice this trip. Walls left from an old building. This was a pretty large structure for the area. On our way back to our four wheelers we scared a bird off the nest which was located in a small, skinny bush not 3 feet high. Didn’t see the bird as it flew off in a flash so not sure what species the eggs are. Then, as we were riding our four wheelers back to the truck Tim came very close to a dove’s nest. The parent went flying off acting injured to lure us away. When we investigated we found two babies. It was a close call because the four wheeler tracks went to each side of the nest. I’m so glad we didn’t run over them. During our trip we saw quite a variety of lizards. I have always enjoyed watching lizards. Many of these were not scared of me and let me take some good pics. On Monday I picked up my new best friend…Miss Scarlett Raven. She’s a purebred german shepherd and will be about 75 pounds full grown. On her first vet visit she weighed 12 pounds….she’s got a lot of growing to do. She’s a real sweetheart. Very calm and brave. She was scared of Samson, our old german shepherd, but instead of running and hiding she stood her ground and barked at him. It didn’t take long though for them to become best buddies. Samson is very good with puppies. He knows they are young and little and he’s very nurturing. Scarlett’s first day was full of changes but she did very well. Didn’t even cry much that first night. She’s settled in nicely and seems very happy. She’s even taking her leash lessons very well. She already comes when called every time and walks very nicely beside me on the leash. She seems to enjoy our lessons together. I’m looking forward to taking her on hikes. She loves being outside and has enjoyed exploring our 4 acres with me. I so want to take her now on trails for exploring but the vet said parvo is very bad this year and has recommended I keep her home until she’s had all her booster shots. I’d rather be safe than sorry. But I couldn’t wait to share her with you. Scarlett having fun chasing the ball with Samson. Today was cold, windy and rainy. I had been swamped with work all week. I finally had free time in the morning to go birding and the weather wasn’t cooperating. So I decided to bird by car. The rain wasn’t steady but instead would come over in waves. From past experience I knew birding opportunities might be pretty good after a rainy night. So I headed out early to drive around Stanley, NM. I tried to drive down one of my favorite roads (Valley Irrigation Road) but it was way too muddy. So I had to stick to paved roads. Even limiting where I could drive I had a great morning. 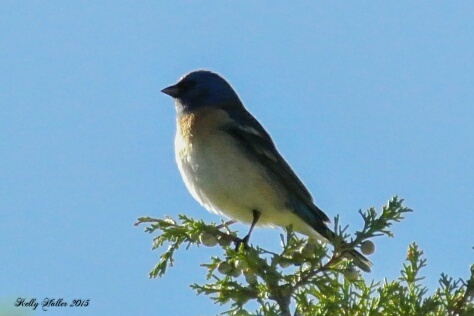 I saw my nemesis the Lazuli Bunting…will I ever get a nice sharp photo? And of course there were plenty of flycatchers about. 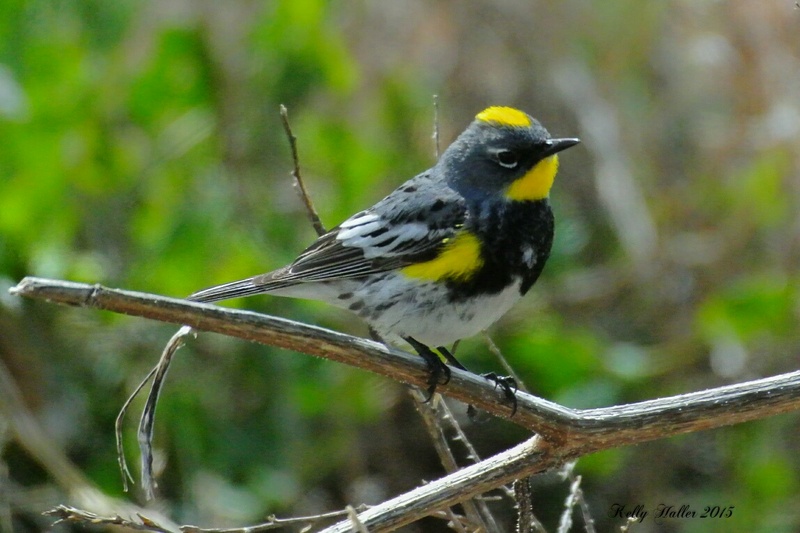 There were lots of yellow rumped warblers. They always make me smile. Lots of evidence of spring. 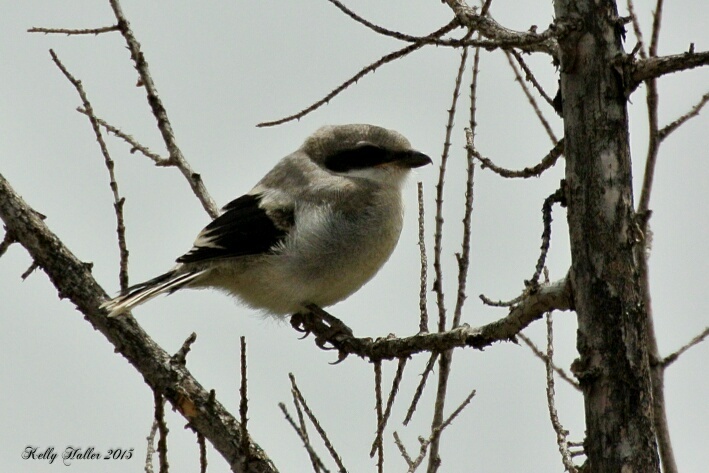 I had noticed a pair of loggerhead shrikes staying in one area for a few weeks. I was rewarded today with the sight of baby loggerhead. Adorable! 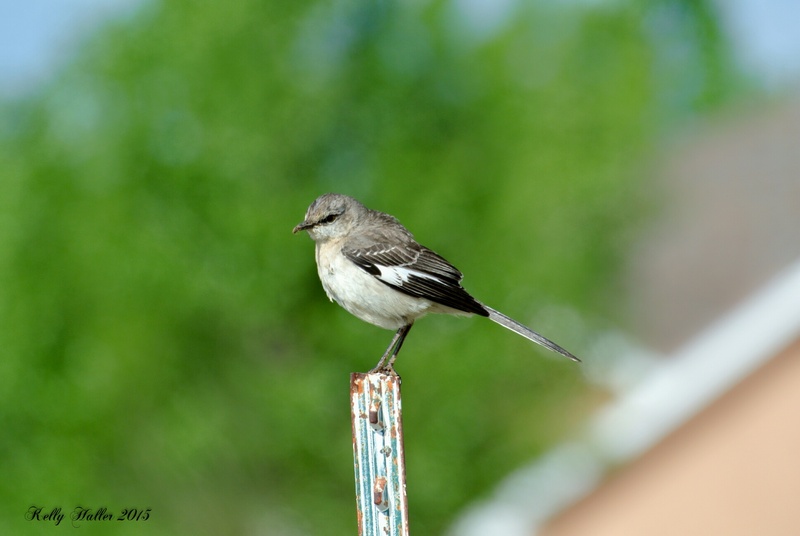 Birds gathering nesting materials, sitting on nests, feeding baby birds and seeing juvenile birds..I love spring! I was thrilled to have a Western tanager land right in front of me while I was photographing the yellow-rumped warbler. Because it had rained earlier there were lots of birds grooming themselves. Most especially the swallows. 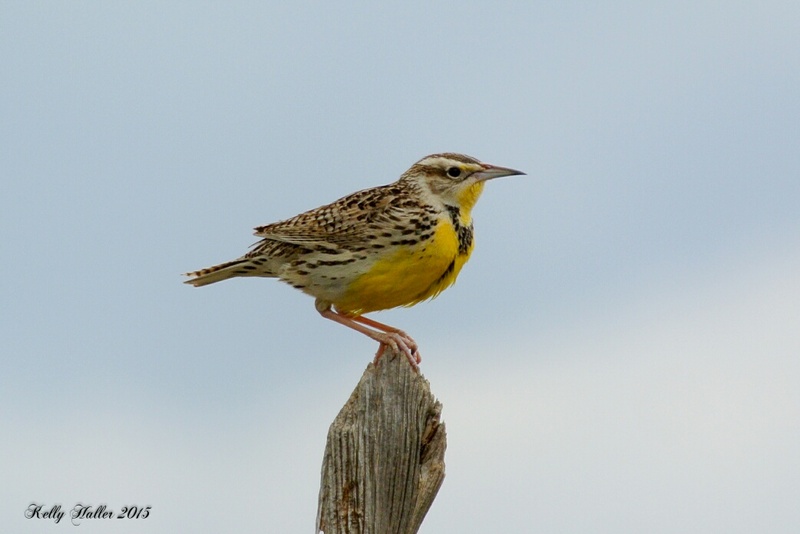 A trip to Stanley wouldn’t be complete without a Western meadowlark and I wasn’t disappointed. 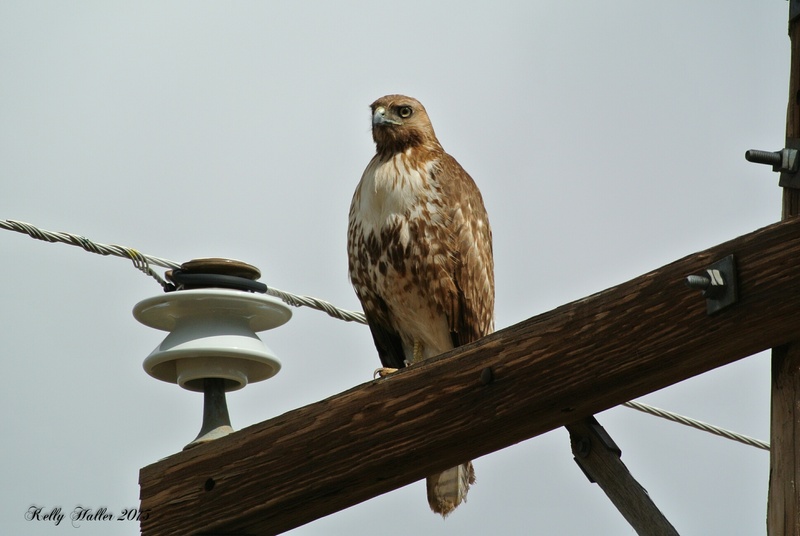 As well as redtailed hawks. 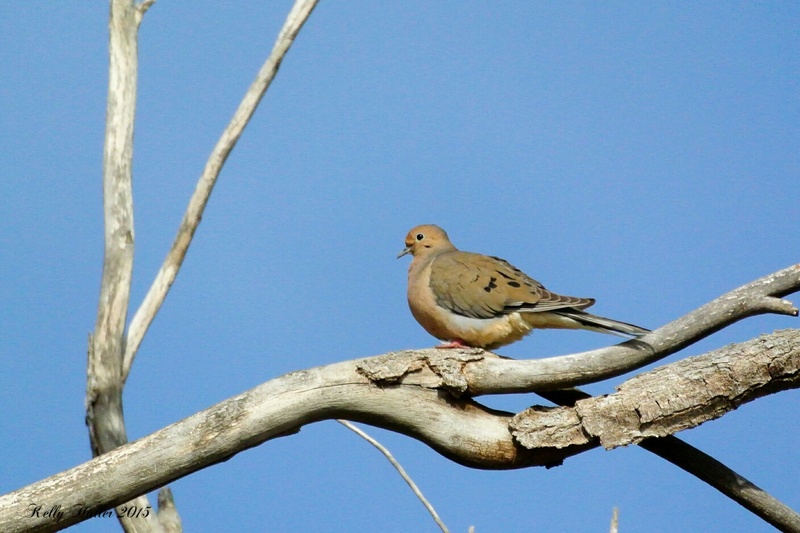 I participated in my first Birdathon, a fund raiser for the Central New Mexico Audubon Society (CNMAS). We traveled to Fort Sumner and visited several locations in the area. The Birdathon lasted 24 hours. We met at Lake Sumner at 10 am on Thursday, May 7. I didn’t count how many of us were there but it was under 20 people I believe. As we approached the lake we first went down to the Pecos River below the dam. Someone had spotted a Black-Chinned Hummingbird female in a nest. I was shown the nest and was able to get a great photo of her with moss in her mouth for building her nest. I really enjoyed seeing that. I got a new bird there, an Olive-Sided Flycatcher. Sadly he was directly between me and the sun so the photo isn’t great. From the river area we moved to the shoreline of the lake. I got a new bird there too, a Forster’s Tern. Again, the bird was flying and at such a great distance the photo was not good. Sigh…. After having lunch we went to Redondo Lake near Fort Sumner. This was a nice small lake that you could drive all the way around in just a few minutes. But it offers a large area of cattails that bring in a diverse amount of birds. We noticed a clump of Ruddy Ducks which turned out to be the parents and seven young ones almost full grown. We were treated to the sight of a Blue Jay who posed nicely for everyone to get a good look at. I got to see a Red-Headed Woodpecker (which is a new bird for me) but sadly didn’t get a photograph. 🙁 He will have to go on my Seen/Heard but Not Photographed List. 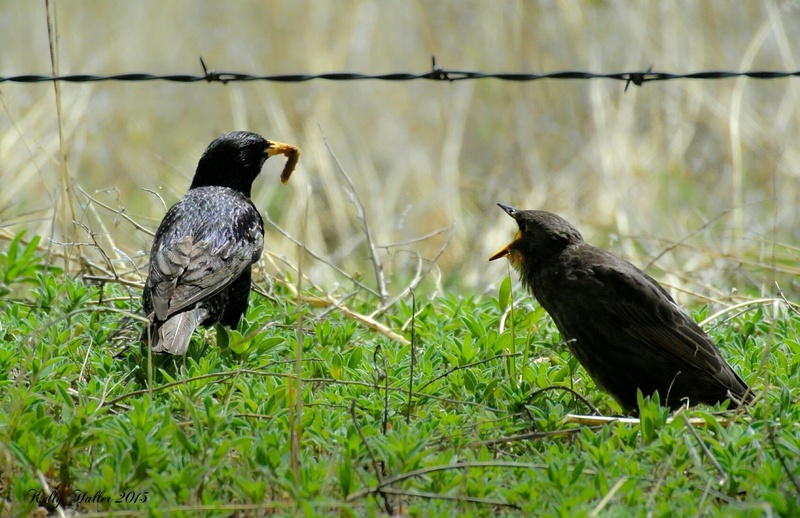 We drove along the farm roads in hopes of seeing a variety of blackbirds – most especially the Bronzed Cowbird. No luck with the Bronzed Cowbird but we saw plenty of Brewer’s Blackbirds, Yellow-Headed Blackbirds, Common and Great Tailed Grackles, and Brown-Headed Blackbirds. They were hanging around the cattle eagerly grabbing up the insects stirred up. We then drove to a location called Melrose Trap. It’s a small grove of trees located in the middle of prairie and farmland. 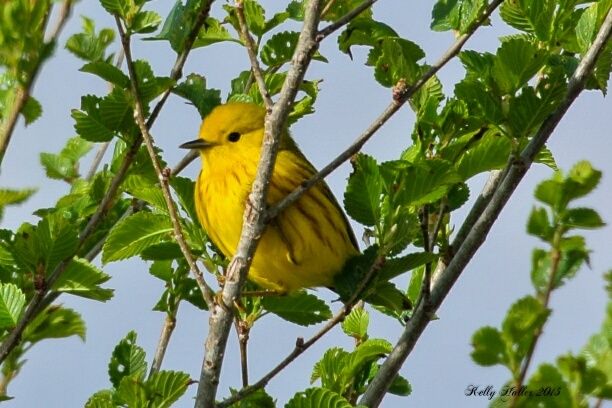 So it’s a huge draw to migrating birds – most especially warblers. We were in high hopes of seeing a variety of species there. 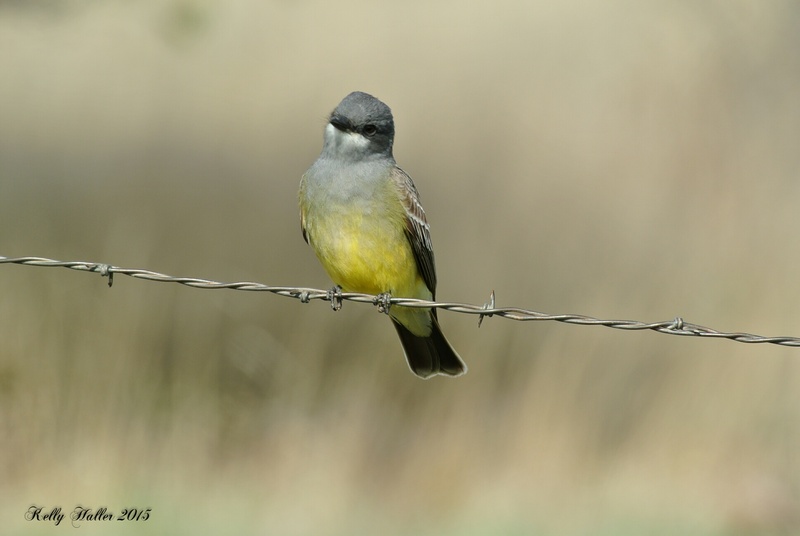 There were lots of Western Kingbirds making lots of racket, which made it difficult for birding by ear. The foliage was dense and lighting low which made for difficult photo ops. But I managed to get some nice pics. 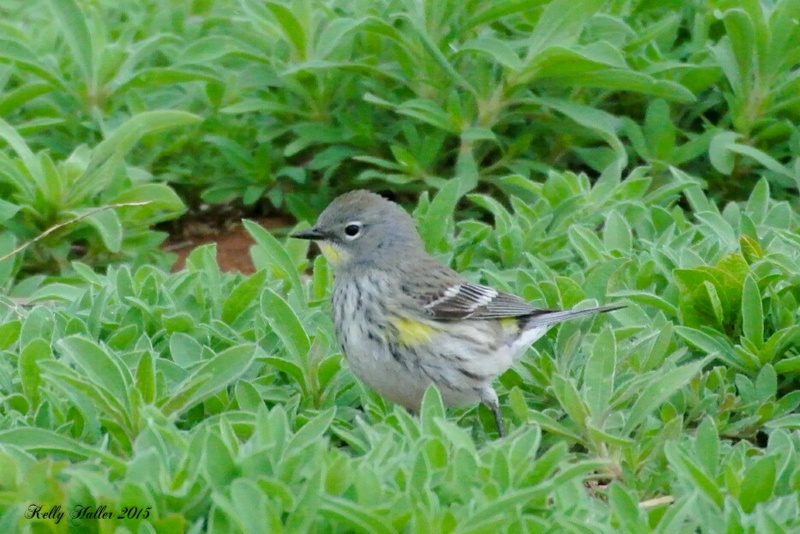 Most especially of a Yellow-Rumped Warbler who sat on a limb not 10 feet away just grooming without a care for us. 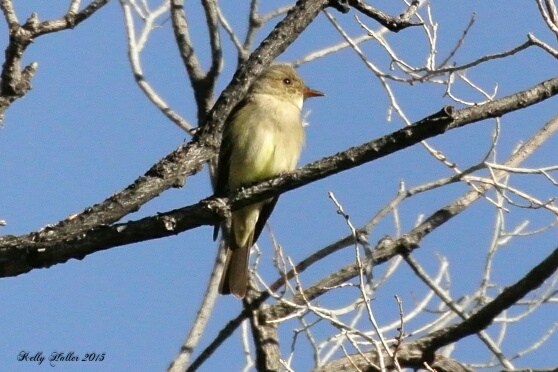 I was thrilled to get a new bird, the Western Wood-Pewee…and a good photo for a change! 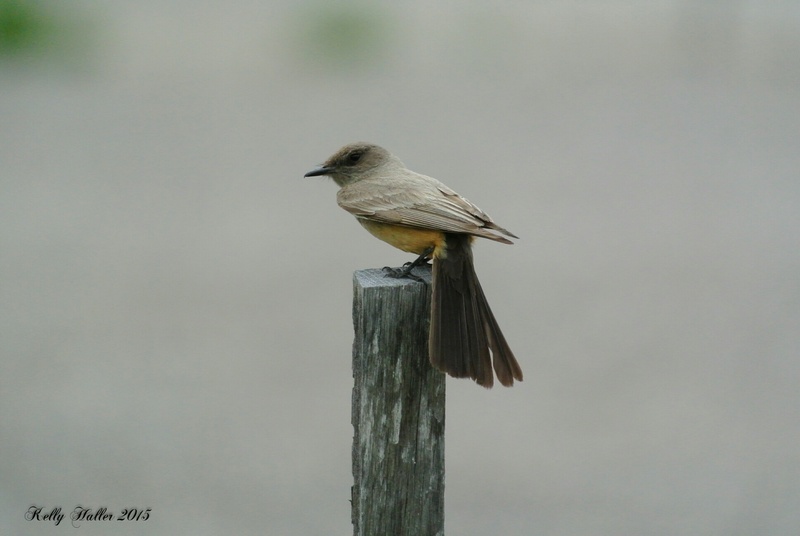 One of the birds on our “love to get list” was a Scissor-Tailed Flycatcher. We drove down the highway from Melrose Trap looking for it but without luck. One my drive back to Fort Sumner that evening I was talking to my husband on the phone and saw one fly up to get a bug. I exclaimed “OH!!! I gotta go! I have to turn around a get a pick of that flycatcher!” I was thrilled to report to the group at dinner that we could add that species to our list. The next morning I got up extremely early (for me) to meet again at the Melrose Trap. The sun was just coming up. I saw there was fog ahead so I wasn’t in any big hurry to get there. There’s this old schoolhouse that I’ve passed many times on this road that I’ve always thought to myself “I’d love to photograph that building”. Well, this morning the lighting was perfect and I had the time to stop. I really enjoyed the photos I was able to capture. I finally arrived at the Melrose Trap. Several birders were already there from our group. The warbler activity was very good but the lighting was very poor due to the foliage of the grove and the fog. Fellow birder Maurice and I quickly found a corner of the grove that was very productive. I got several new birds that morning. But I was able to get a few nice pics. Most especially of the a new bird for me the Chestnut-Sided Warbler. 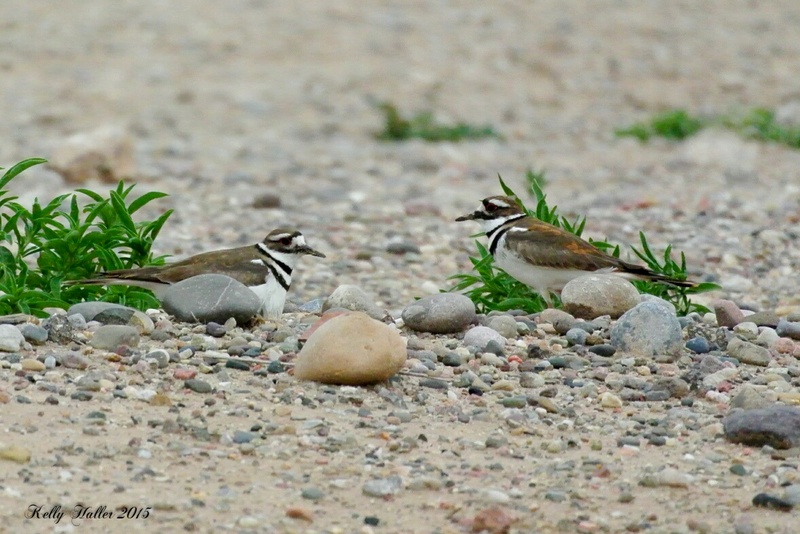 I also got to photograph a Northern Waterthrush and Lincoln’s Sparrow…two new birds!. All of a sudden in the grasses beyond the grove we saw a big bird land in the sage bushes. 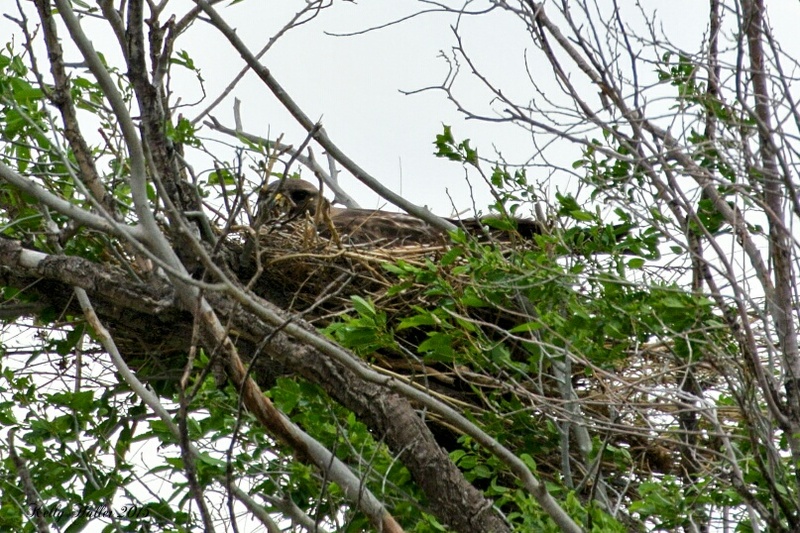 We quickly saw it was a baby Great Horned Owl. What a treat! Part of the group left the grove to go in search of the Bronzed Cowbird that had eluded them the previous day. I decided to stay with Maurice to see if we could get any more new warblers. Sadly about that time the activity seemed to die down. So we decided it was probably time to head back and meet up with the group for the final bird count at 10 am. On my drive back I spotted a large woodpecker fly into a tree. I quickly pulled off to find it. Maurice saw me pull off and followed me in. We both saw two woodpeckers fly off to a further tree. One was clearly a Ladder-Backed Woodpecker but the other was much bigger and had white patches on its wings and rump and red on it’s head. With those markings it was clearly a Sapsucker. After consulting with each other we came to the conclusion that it was a Yellow-Bellied Sapsucker. Which was a new bird for me! and an uncommon sighting for the area. 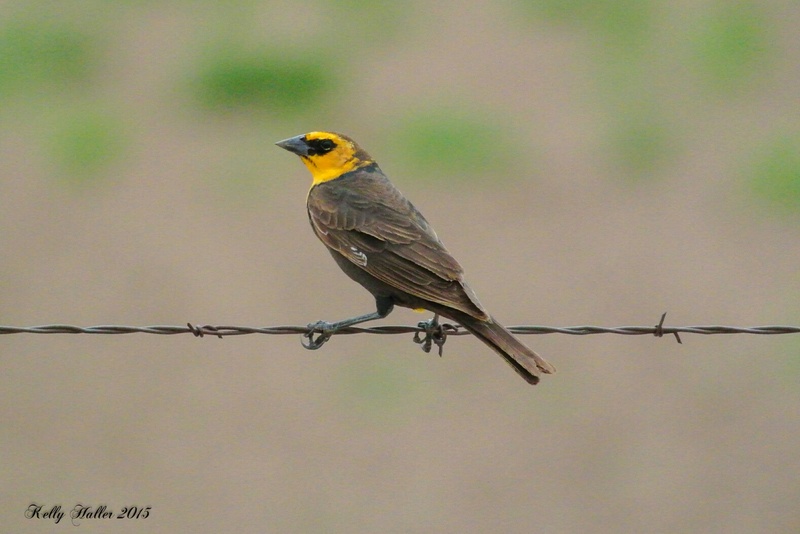 We met up with the group at 10 am and heard they finally got their Bronzed Cowbird. Everyone went over their sightings and the group as a whole got 108 birds. Not too bad for how few of us there were. I ventured to the lake and a Turkey Vulture on the shore. I got pretty close and was able to get several pics. I especially liked the ones in flight. On my way out of the park I saw another lifer! 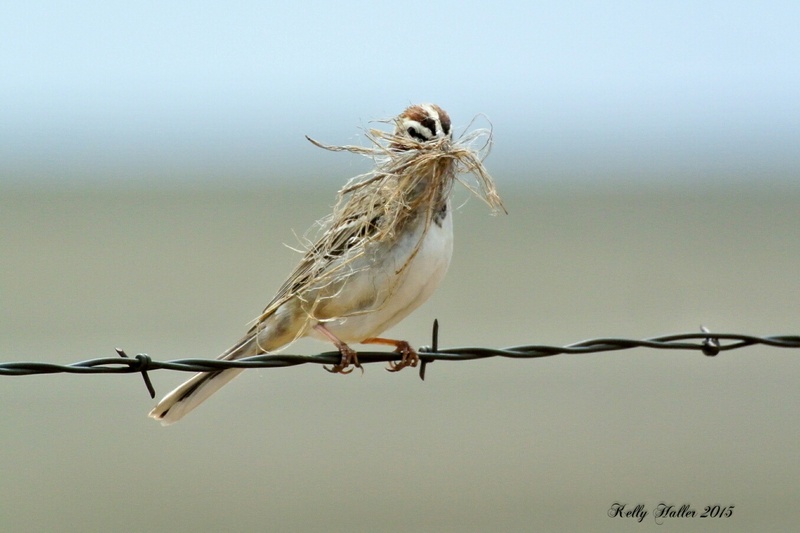 A Grasshopper Sparrow! Sadly, it was time to head home. I really enjoyed spending two whole days birding. I got several new birds bringing my Life List to 321 birds that I’ve photographed and identified! My total count of Seen/Heard and Photographed is now at 330 birds! This past week I was able to get out birding several times. The weather was beautiful and my schedule was lighter. So I strapped on my hiking boots, grabbed my camera and hit the trails. My first stop was Embudito. I knew the orioles had to be there soon and was hoping to get the Scott’s Oriole. I climbed the higher trail instead of hiking along the arroyo. The last couple times I had been there I had heard a lot of birdsong up the hillside. It was a good choice that day. 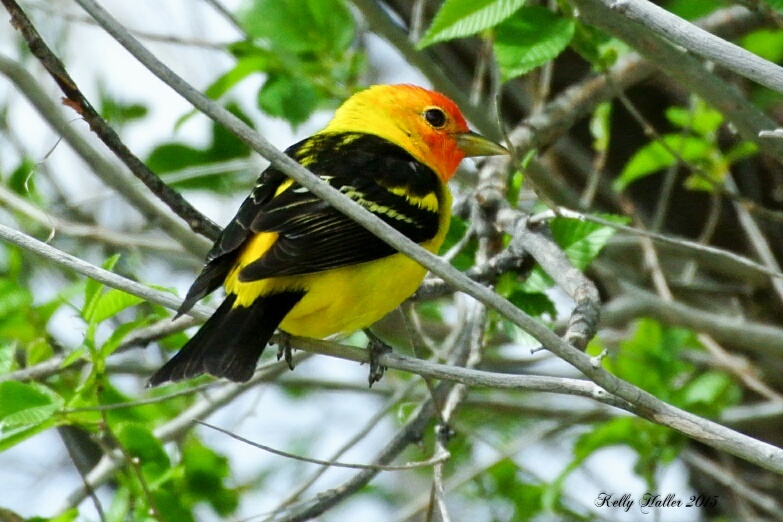 I came around a bend and saw both the Scott’s and Bullock’s Orioles feeding in a bush. They saw me at the same time and flew off. I spent the next 20 minutes hunting them down for a photo. The effort was worth it. The Scott’s Oriole was a lifer for me. I also got pretty close to a Rufous-Crowned Sparrow singing in a bush along the trail. I made my way down to the spring so I could hike along the arroyo on my way out. I saw a pair of Spotted Towhees and a Juniper Titmouse trying to get the attention of a female. He was so camoflauged that the only way I saw him was because he was singing at the top of his lungs and chasing the female. Another day I had to go to Los Lunas so I thought I would take the opportunity to check on the burrowing owls. While there I had a road runner cross my path. He was busy hunting for lizards and didn’t seem to mind me following along with the car. Soon I came to the owls and there was a pair right next to the road. I sat and watched for a while. There was a bush nearby that they loved sitting in for a better view of the surroundings. I think they are used to people watching them because they didn’t seem too concerned about me. Since I had the time I thought I would drive through the Valle de Oro Refuge to see what might be around. I never seem to have any luck there. I always hear of all these sightings of birds that I need for my life list, but they have never been there when I visit. This day didn’t provide anything new, but I did get some nice shots of a variety of birds there enjoying the field being flooded. One day I took advantage of being on the very north end of town one day and stopped in at the Tramway wetlands. I was rewarded with a pair of Canada Geese with two babies. I’d never seen baby geese before so it was a real treat. Not much else there that day though. Lastly I hiked Bear Canyon for the first time. I didn’t have much time and thought it looked like a nice hike. There weren’t many birds out that day. It was windy and there were spotty rain showers all over town. 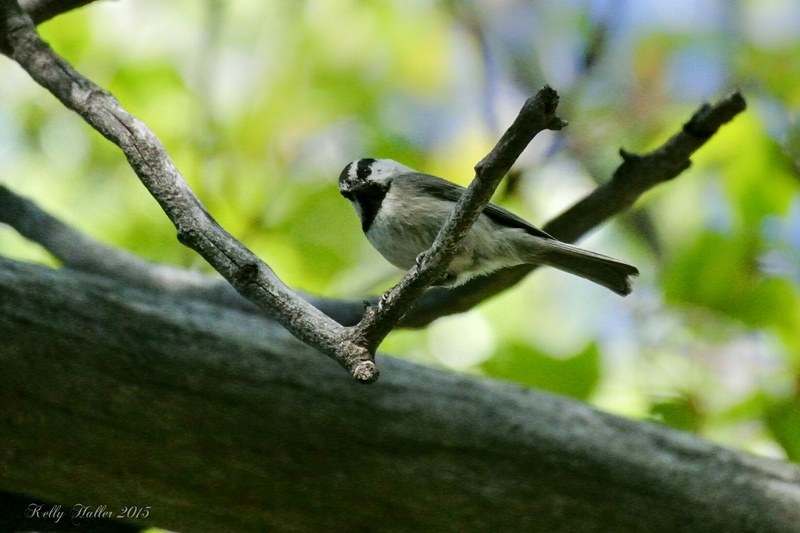 I saw lots of Black-Throated Sparrows. I never tire of these birds. They make me smile every time. Always sitting in the top of a bush or cactus singing away. I especially liked the photo I got of one singing in a bush with flowers around him. The other bird I saw plenty of was the Blue-Gray Gnatcatcher. These little guys are so adorable. This particular male wasn’t shy at all and let me get within 10 feet of him. Made for a crisp photo. The view of the Sandias was specatular that day. That trail makes for a nice photo as there aren’t very many houses along the foothills. I soon had to hurry back to my car as the rain showers seemed to be headed my way. The week was a success getting that Scott’s Oriole! Next stop the Birdathon at Fort Sumner! This year I have decided to take every opportunity to re-explore the trails in the Sandia Mountains. I have always enjoyed exploring the varied trails and am looking forward to seeing some favorites as well as some new ones. I haven’t hiked the Domingo Baca trail in over 10 years. I went with friends to see the airplane crash then. It was a tough hike but well worth the effort. This time I only went as far as the spring as I was by myself. The weather this spring has been cool and rainy. The view of the Sandia Mountains was very beautiful the morning I set out. It had rained during the night and the clouds were still hovering along the peaks. The air was cool and crisp and the views of Albuquerque were amazing. I was wishing I had my polarized filter for better pics. I didn’t see too many birds or butterflies but managed to get a few shots. 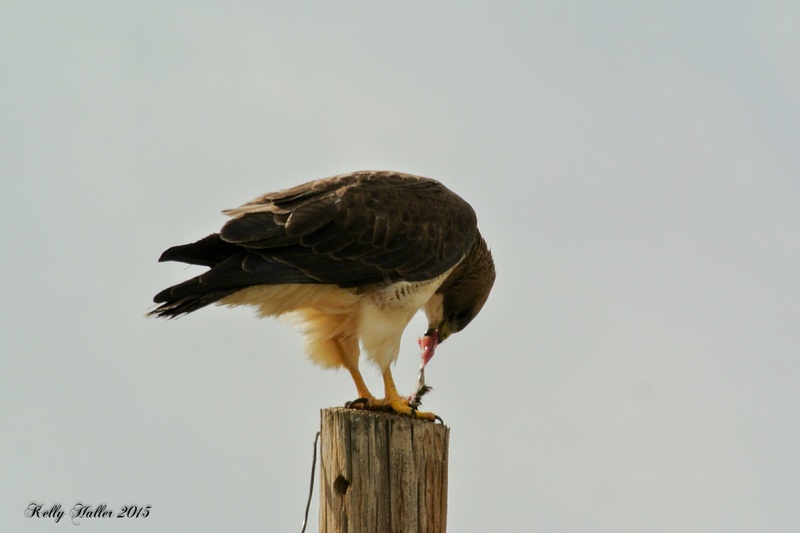 The highlight was seeing a Cooper’s Hawk building a nest in one of the cottonwood trees in the Elena Gallegos picnic area. He was a little too far way for a good pic but it was exciting to see him nonetheless. He flew over me a couple times during the hike as well. I heard several blue-gray gnatcatchers in the trees and bushes while I hiked. I managed to get a couple of nice pics of them even though they are so small and quick! I finally made it to the spring. It was flowing very nicely since we’ve had a lot of rain. It was so nice to sit and relax and enjoy the sound of flowing water (a rarity here in NM). The signs of spring growth were a cheery sight. I am so ready for warm weather! I don’t know what this growth is on the tree. I’ve never seen anything like it before. It was in patches all over and such a bright orange! On the way back down the trail I heard the tram overhead and managed to get a quick pic before it disappeared into the clouds above. I saw several butterflies and was able to get pics as they weren’t flying to energetically in the cooler weather. Hmmm….maybe Joe and help me identify this one. He says “they’re easy!” uh….I don’t think so LOL! No clue yet what this one is either. I can definitely tell I’m a beginner butterfly enthusiast. I will have to spend some time thumbing through my book to identify some of my finds. I really enjoyed revisiting the Domingo Baca canyon. I’m not sure why I stayed away so long…..
Wow…I’ve gotten way behind on my blog. Life has been very busy. But I have been making time to get out hiking and birding. On April 23, my friend Bob Hall flew into town from Oregon. He’s a fellow birder and was a field biologist in his working days. This visit was the first time I actually met him in person. The day was fun and Bob was a great birding partner. Since he hadn’t been to Albuquerque before, I drove him to the top of the Sandia Mountains so he could see the city from the peak. On our way up the crest road we saw wild turkeys. That was the first time I’d actually seen turkey in the Sandias. While there we saw a Yellow-Rumped Warbler singing and feeding in the pines. He was a real treat to watch. We worked out way down the crest road. Our next stop was at the 10K North trail parking lot. We saw swallows flying and heard several woodpeckers in the area as well as other birds singing. I had told Bob that I needed an American Three-Toed Woodpecker and that I had heard they had been spotted here in the past. 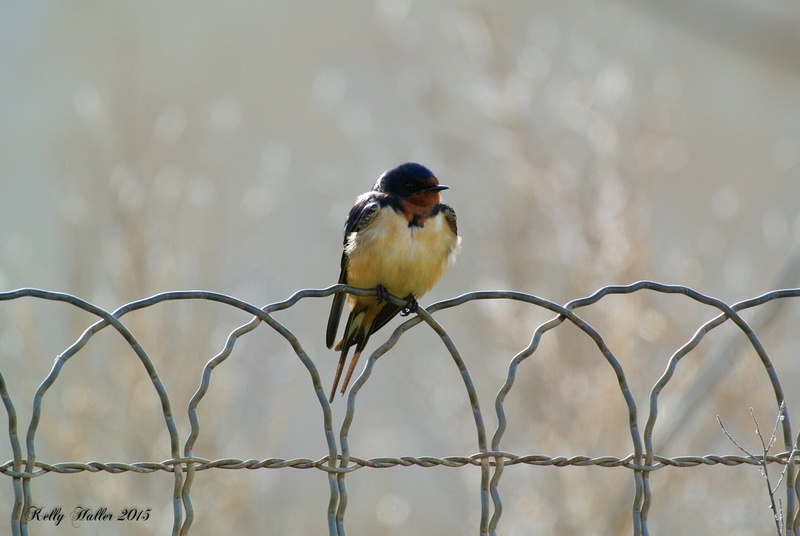 While we were watching the Violet-Green Swallows (a new bird for my life list!) we saw a pair of woodpeckers land in a dead pine tree. I quickly took some photos but the distance and lighting didn’t make for great photos. Bob had a good pair of binoculars and he told me “I’m 98% sure those are the three-toed woodpeckers you were looking for.” I was so excited that I exclaimed “REALLY!!???!! 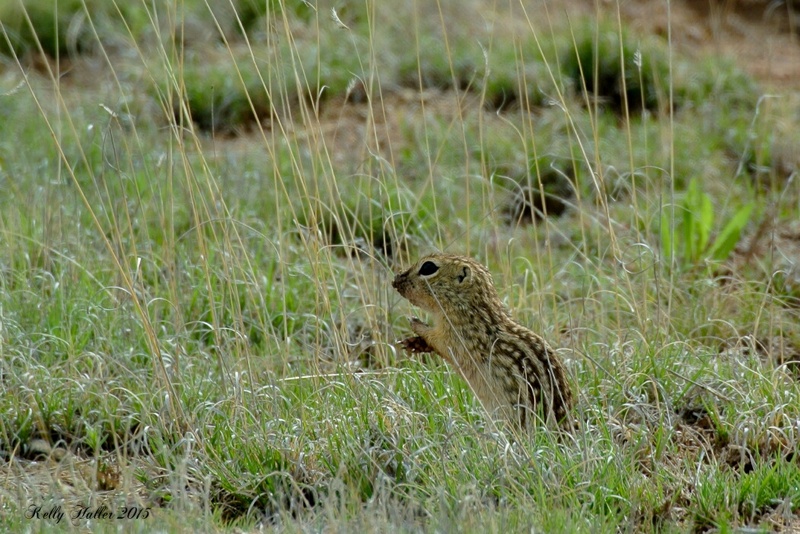 !” Well…my delight echoed through the canyon and those woodpeckers took off! Hmmm….I told Bob I guess I needed to work on my birding voice. When I got home I looked through my photos and had one pic that showed the yellow on the head conclusively making the sighting 100% three-toed woodpecker. Another lifer! We worked our way down the road but didn’t see any more interesting birds. But we did get to see a nice group of mule deer. Our next stop was the Ojito de San Antonio. I’ve had great luck there recently where the spring makes a pool. Bob was excited to see Cedar Waxwing and a new bird for him, the Evening Grosbeak. Lots of activity at the spring made for a fun time birding. We stopped briefly at the church there next to where we parked and enjoyed watching an Ash-Throated Flycatcher and Western Bluebird feeding. 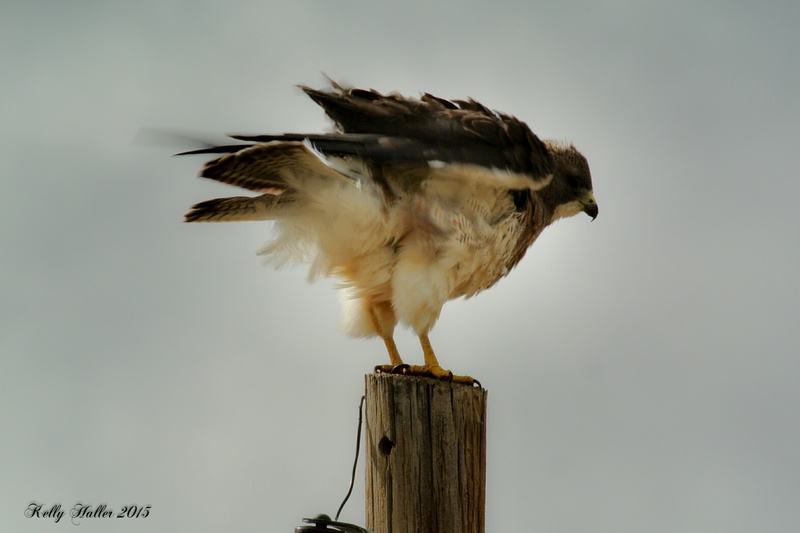 I asked Bob if he wanted to go into town to the Rio Grande Nature Center along the river or head east and see the prairie lands with Swainson’s Hawks. 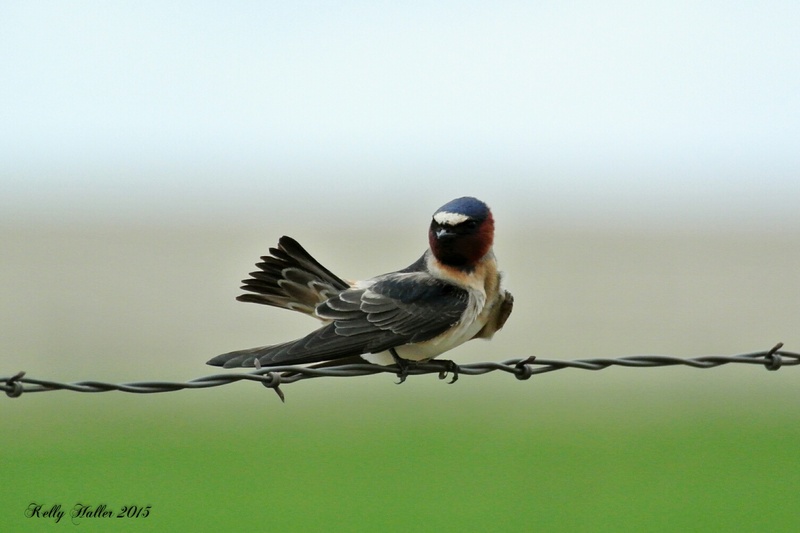 He said definitely east as Swainson’s were one of his favorite birds and it had been a long time since he’d seen one. So we headed out to Stanley and I drove him down Valley Irrigation Road (one of my favorite drives for birding). And right off the bat a Swainson’s Hawk landed right in front of us. It was a great sight. Along the drive we saw a Lark Sparrow and Burrowing Owls among other things. We made the most of the day and ended up seeing 40 different bird species that day. Very successful!